Tansen is a small ancient hill town situated 4300 meters above sea level. It is located on the way from Pokhara to Lumbini. Major attractions here are the ancient culture, excellent mountain views, serene atmosphere and friendly people. The weather here makes it a pleasant place to visit in any season. On clear days Dhaulagiri, Annapurna, Manaslu, Gauri Shankar and other peaks can be seen. Dhaka - the most popular hand woven cloth of Nepal comes from this region. The Nepali topi (national cap) is made of Dhaka and You can see the weavers at work on their looms or see a bazaar of Dhakas in Tanseen. It is believed that the migrant from Kathmandu valley, specially the Newars played an important role in enriching the architecture and culture of Tansen, and this can be seen today in Tansen. About the word Palpa : Palpa is a district of Nepal. It is one of the district of the Lumbini Zone. 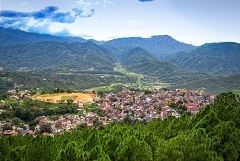 Tansen is the head quarter of Palpa district and hence, many people commonly refer Tansen as Palpa. Butwal, Bhairahawa and Lumbini are other three important cities that are part of the Lumbini Zone. Tasen is 25 miles (40 kilimeters) from Butwal and 78 miles (125 kilometers) from Pokhara. By Bus, It takes 1 hour from Butwal and 5 to 6 hours from Pokhara. Regular public buses are available from Butwal and Pokhara. From Kathmandu, you can get to Pokhara, stay there for a few days, then head to Tansen, or you can take the route Kathmandu - Chitwan - Butwal - Tansen. The total road distance from Kathmandu to Tansen is about 187 miles (about 300 kilometers), and a journey of 11 hours. Bus fares are inexpensive. 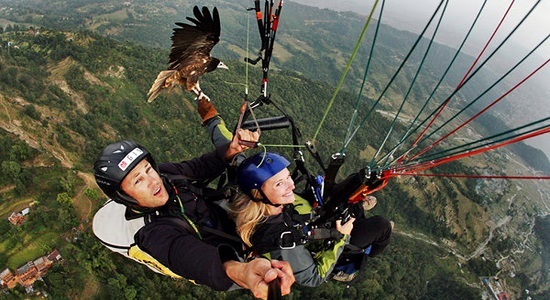 You can also fly in a helicopter from Kathmandu to Tansen. Fares are expensive. See here Rana buildings, Newari houses, carved windows and pagoda style temples, also meet folks at shopping in one of the highest and busiest bazaars in Nepal! Palpa Ranighat: Visit the ancient building (palace) set on a massive rock bed at the bank of the Kali Gandaki river for viewing palace garden, stone walls, and a small shrine. This palace was built in 1892 by Governor Khadka Shamser in memory of his wife Tej Kumari, and is often called the Taj Mahal of Nepal. In the center of the town lies a 64 room Palace, a representation of arts and crafts of the ancient Palpa. On the saddest morning of 31st of January 2006, Nepal's Maoist Rebels launched attacks in Tansen with no apparent reasons. They fought with local authorities and bombarded many ancient buildings including the Palace which had housed government offices. Many historical buildings including the Tansen palace was destroyed. Tansen Palace has a good reputation and popularity. In fact, it's importance falls right after the Singha Durbar of Kathmandu (The place where, Nepal's most top ministers stay and work inside this secure compound, and also where the Nepal's Parliament office is located) The Tansen Palace is the heart of Palpa, attracting International as well as Domestic tourists to this beautiful hill. Many buildings which were destroyed by the Maoists are in the process of Historic re-construction, and without a doubt, Nepali Maoists will live forever with sorrows in their hearts for attempting to destroy a part of the beauty and history of Nepal. An easy trekking of 6 miles from Tansen, brings you to a beautiful spot, the Bhairabsthan temple. From here you can view Himalayas including Dhaulagiri, Annapurna and Machhapuchhare and witness cultural attractions. The temple has a large Trishul (Trident), and it receives a large number of visitors on every Saturday and Tuesday. People sacrifice animals and offer grains, and fruits to please the Hindu God Bhairab, whose figure is believed to be kept hidden under the floor of the temple and the figure is identically to the Kal Bhairab status of Kathmandu, located at Durbar Square. Kal Bhairab is the Nepalese God of Destruction. Temples dedicated to him are located in many parts of Nepal. Visit Shreenagar for 360 degree view of hills surrounding Palpa and beyond. Also visit the Bhagwati and Amaar Narayan temple situated in the region. We are travels operating firm in Gorakhpur, Uttar Pradesh established since 1980 by the two brothers Mr. Anil and Sunil Kesherwani. We have started our business with 1 Bus with our good and timeliness service we have created a good reputation in mind of people and became a biggest Bus fleet owner in the city. 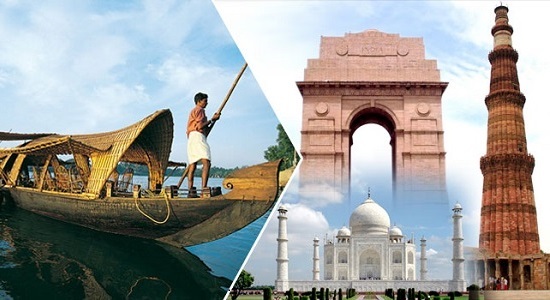 We are best and oldest travel agent in Gorakhpur,Tour operator in Gorakhpur for Tansen Tour,Bus hire for Tansen Tour in Gorakhpur,Tour Package for Tansen Tour in Gorakhpur,Travel agent for Tansen Tour in Gorakhpur,Buses for Tansen Tour,Bus Booking Service for Tansen Tour in Gorakhpur.